Forgive the double-post, but I've run into some trouble regarding the reference points for a model I've been working on. The reference is (4+(2sqrt2)) : (7+(2sqrt2)). I'm going to use the midpoint of the edge as another reference point, so the equivalent proportion in each quadrant would be (from the corner) (4+(2sqrt2)) : 3. The first part is easy to find since it's essentially a Fish Base, but for some reason I'm having trouble constructing (7+(2sqrt2)). An alternate proportion that would be of equal help is (3+(2sqrt2)) : 4. It, too, should be easier than I'm finding it to be. Hi guys. What references can I use to crease the following marks in my paper? The rest of my model is very simple to fold so I do hope that this part doesn't get to complicated . Last edited by Gerardo on April 6th, 2018, 1:39 am, edited 1 time in total. Theoretically you can use every method that gives you fifths. I like to use dichotomy to crease in 5ths (that's what is explained in the second link from origami_8 post). The advantage is that you don't have unwanted creases (apart on an edge - but with a bit of practice, you can fold in 5ths quite exactly on your first iteration). Thanks guys. I checked out the links you sent me origami_8. The tenth I need is regarding the diagonal middle of the paper. 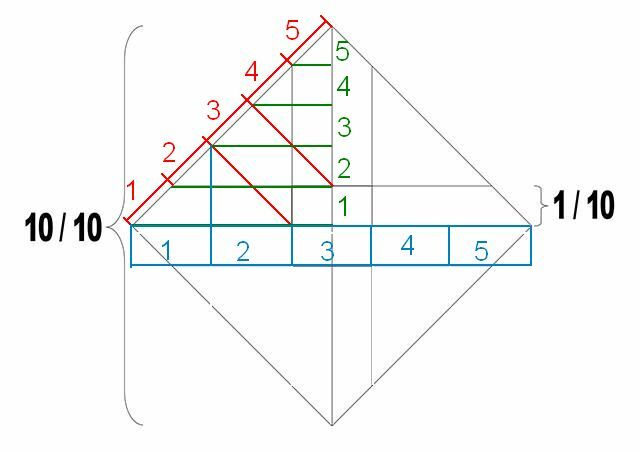 I think the method in the second weppage, the diagrams made by you Anna, is doable making the pinch folds over the diagonal middle instead of the border of the paper. I'm gonna try it out later today. I was hoping there were other methods precisely because I'm looking for the tenth regarding the diagonal middle instead of the horizontal or vertical. What do you guys think? But Gerardo, it is fifths on the edge of the paper, so any method that gives you fifths on the edge of the paper will do. But I agree, that making the fifths along the middle line using the method from my diagrams is the easiest, since you get only two additional pinches per middle line. Ok, my mind was blown! I should've known that but I didn't . Thanks origami_8, this will be very useful for future models . Also, I tried your method in the diagonal middle line and it worked perfectly . Any ideas for how to achieve ((3sqrt2)+4) : 4 : 2 (from the corner) in one quadrant of the paper? I've tried everything I know, and nothing's given me the desired proportion. It's for what I hope will be a final version of my Tiger model. Baltorigamist wrote: Any ideas for how to achieve ((3sqrt2)+4) : 4 : 2 (from the corner) in one quadrant of the paper? This thread has been pretty inactive for a while but here goes. The reference point I am trying to find is 1:1+2sqrt(6-4sqrt(2))+sqrt2.... Havent been able to quite understand some previous explanations, as images have since died. For irrational reference points of the form a+b(sqrt2), Satoshi Kamiya has a generator here. Tankoda, you might be able to convert your needed reference and use that. Failing that, is there a desired split of the latter part of your reference point? What do you mean by a desired split? After crunching the numbers a little, I managed to simplify it down to 1 : (5-sqrt2). This translates to 1/(6-sqrt2), which I put into Kamiya’s calculator as (6) + ((-1)sqrt2). It gave a fairly easy solution, but I can’t link to it due to the limits of his site. See if you get the same decimal as I did: 0.21806.